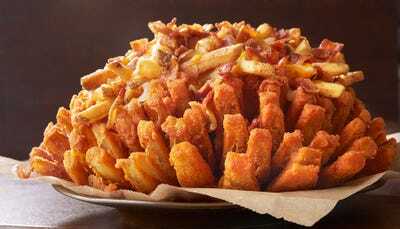 Outback Steakhouse has made the Bloomin’ Onion — a 1,954 calorie battered and deep-friend onion — even more depraved. Foodbeast reports that for a limited time, Outback will offer a “Loaded Bloomin’ Onion” topped with french fries, two kinds of cheese, and bacon. Outback SteakhouseThe loaded Bloomin’ Onion. The company didn’t disclose the calorie count for the new item, which is part of a “Big Australia” promotion. However, Outback’s cheese fries contain more than 1,000 calories — putting the loaded Bloomin’ Onion at more than 3,000 calories total. That’s as much as a moderately active adult male should get in a whole day, according to the USDA.